The superfatting Mustela cleansing gel has been created for babies with dry skin or temporarily resected. The superfatting Mustela cleansing gel has been created for babies with dry skin or temporarily resected. Its formula has been specifically formulated for use from birth to the baby's daily bath. Designed for cleaning the skin and wash hair without damaging delicadezay; nourishes and soothes dry skin; preserves the hydrolipidic film, its formula compensates the drying effects of hard water. Enriched with avocado Perséose formula helps strengthen your baby's skin barrier and preserve the richness of your skin cell. How to Use Gel lavante superfatting the Cold Cream Mustela nutriprotector? In the daily bath your baby wets the body and hair, then pick up a small amount of gel with your hands and make a gentle massage foaming then rinse thoroughly. Paraque the effectiveness of the product is better Use it along with the rest of the product range Cold Cream. 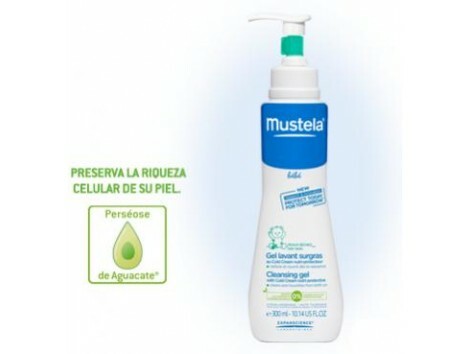 The cleansing gel Cold Cream superfatting to form a creamy foam with delicate fragrance Mustela. It rinses easily and leaves the skin soft and silky. The practical dispenser pack sets the amount for each use. Formula biodegradable (OECD 302B method). 0% parabens, phthalates, phenoxyethanol. Ingredients: Aqua (Water), Glycerin, Cocamidopropyl Betaine, Sodium Sulfate Myreth, Coco-Glucoside, PEG-3 Distearate, PEG-150 Distearate, Glyceryl Caprylate, Glycol Distearate, Parfum (Fragrance), Polyquaternium-10, Cera Alba (Beeswax) , Prunus Amygdalus Dulcis (Sweet Almond) Oil, Potassium Sorbate, Citric Acid, Ceramide 3 Persea Gratissima (Avocado) Fruit Extract. You have 14 days to return your order from the date of arrival at your home. We guarantee a refund of the amount paid for products returned of your order. Display all details of our return policy. El producto se ha añadido a la cesta. ¿Qué deseas hacer ahora?